Our office will be closed from 27th April to 6th May. [LNX-003　Rev2] RS-485/422　LAN Converter HuMANDATA LTD.
LNX-003 is a LAN converter which makes it possible to use RS-485/422 devices via Ethernet local area network. LNX-003e is an economy model of LNX-003 which only PoE function is removed. LNX-003 is a LAN converter which makes it possible to use RS-485/422 devices via Ethernet local area network. 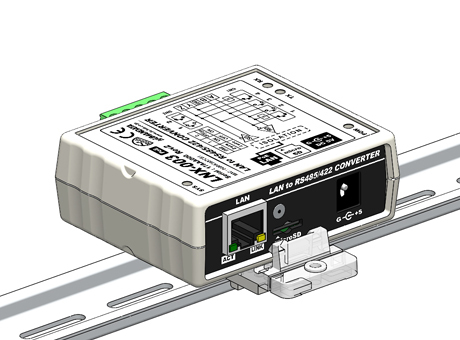 RS-485/422 side is isolated and the LAN interface is also isolated, so LNX-003 consists of double isolation.Tunneling mode is available by connecting with LNX-001 (USB to LAN converter) or LNX-003. In that case, connecting with devices in other RS-485/422 network is possible. And by using TCP/UDP or Telnet, direct control from PC is also available. LNX-003 supports PoE function as a standard model, making it possible to be powered via LAN cable (PoE compatible HUB or other is required). It can also be operated from AC adapter. LNX-003e is an economy model of LNX-003 from which only PoE function is removed. It requires AC adapter for power supply. Network setting can be set by a microSD card. Restoring the setting information from a microSD card is very convenient when replacing LNX-003. *Attachment A for panel mount is separately sold part. By using TCP/IP or Telnet, direct control from PC is also available. It is easily restored at the time of the exchange by microSD. It can send configuration data by e-mail attachments. It is setable in PC out of the network segment. Backup of the configuration data is easy. 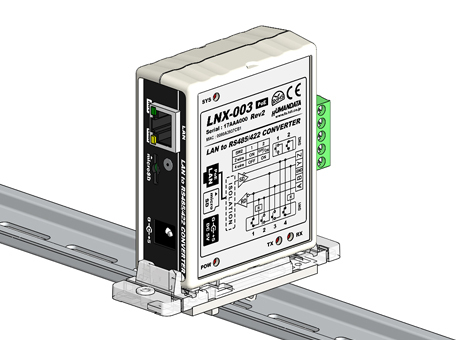 Direct communication between two LNX-003 without PCs offers you to connect separated a RS-485/422 networks. By using cross cable, one to one connection is also available. LNX-001 offers you to control as USB interface via the LAN. By connecting this with LNX-003 in tunneling mode, virtual COM port and D2XX-API by FTDI is available. Technical knowledge about the network is not needed. Communication with RS-485/422 devices via Ethernet local area network is available. This application makes configured data of the LNX series. After saving the configuration data to the microSD, and insert the product it. It will be automatically set by turning on the power of LNX-003. Then backup file is made to microSD card automatically.